Hugely enjoyable, sharply written and superbly directed British drama, with a terrific central performance by Michael Sheen. 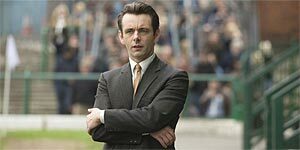 Based on the novel by David Peace, The Damned United stars Michael Sheen as football manager Brian Clough. Like the book, the film cuts between Clough's disastrous 44-day stint as the manager of Leeds United and the years leading up to it, including his partnership with Peter Taylor (Timothy Spall, keeping the Spallness Factor pleasingly low for once) and his astonishing (and still unmatched) achievements with Derby County. The film also examines Clough's rivalry with (and arguably, obsession with) former Leeds manager Don Revie (Colm Meaney), who Clough initially idolises and then comes to despise, following a perceived snubbing incident and, later, Revie's reputation for encouraging on-pitch thuggery. Adding to his already impressive roster of real-life roles (including Tony Blair, Kenneth Williams and David Frost) Michael Sheen is simply sensational as Brian Clough – indeed, his delivery is so perfect that you'll find yourself doing Sheen-as-Clough impressions all the way home afterwards. There's also strong support from Spall, Meaney and Jim Broadbent as beleagured Derby Chairman Sam Longson. Peter Morgan's excellent script crackles with quotable dialogue and contains several laugh-out-loud moments, but also paints a genuinely moving portrait of the friendship between Clough and Taylor. Similarly, Hooper orchestrates several impressive scenes (in particular a fabulous sequence where Clough spends an entire match pacing up and down the changing room, listening to the cheers and gasps outside) and makes strong use of archive footage throughout. The film is also beautifully shot, courtesy of Ben Smithard's cinematography, while the production design perfectly captures the smoky, grubby atmosphere of the 1970s, particularly during the boardroom scenes. Most importantly, the film is also careful to cater to both football fans and the uninitiated alike – rest assured that no prior knowledge of football is required to enjoy the film. The Damned United is a hugely entertaining drama with a strong script, impressive direction and a pitch-perfect performance from Michael Sheen. Highly recommended.